For a minimal investment, you can buy a franchise/license to own and operate an e-load vending machine. Topping up your prepaid mobile phone is now as easy as buying bottled water from a vendo machine, thanks to ULOAD. Mindmap Commtech, exclusive distributor of ULOAD vending machines, is a local joint venture with Forth Corp. Co. Ltd. of Thailand. 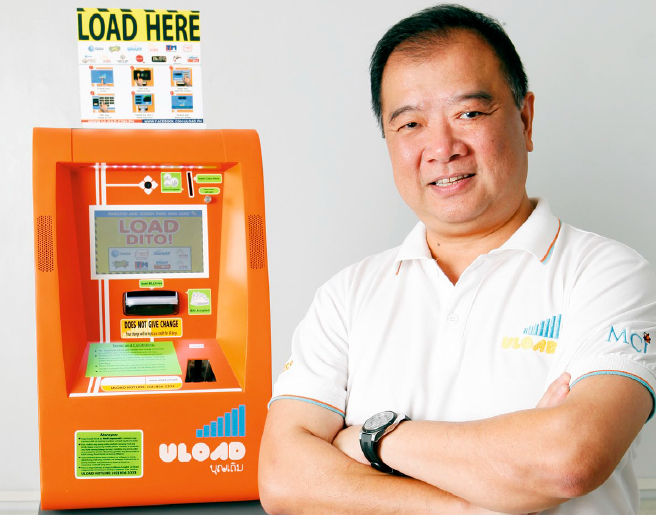 ULOAD is an all-in-one digital e-load vending machine, serving subscribers of the country’s major telcos. It has expanded its business to include online gaming credit and bills payment. The kiosks are designed to be unmanned and operational 24/7. This way, it provides convenience to the vending machine owners and the customers. What started as a venture with only a couple of machines in 2011, says Thomas Sun, Mindmap’s general manager, now has multiplied to an operation with over 1,400 kiosks all over the Philippines. To further develop its niche in the Philippine market, ULOAD opened the business to entrepreneurs looking for a secondary source of income. Sun explains that an initial investment of P28,000 gives a franchise holder a 3-year license for a kiosk. About P8,000 goes to license fees and P10,000 as security deposit (refundable), the remainder of the franchise fee amount is earmarked for initial load inventory. With this investment, the franchise holder receives a commission of 5% (up to a maximum of 7.5% on gross sales with a higher initial investment). Return on investment (ROI) can be attained in just three to six months, depending on sales. For now, there’s no stopping Sun and his team from expanding ULOAD’s reach all over the country. Aside from their in-house sales team and representatives, they do road shows in schools and universities— a very potent niche for their market. Mindmap also inked a deal in 2014 with Vente, which is now offering ULOAD franchise (at a steep discount) to its franchisees who want to install the vending kiosks within their shops so they can earn additional income. Sun is also optimistic that more ULOAD machines will be found along Metro Manila’s MRT and LRT train stations and in other transport terminals. Through this, rushing commuters will find it more convenient to top up their cell phone credits. This article was originally published in the December 2012 to January 2013 issue of Entrepreneur magazine and was recently updated by the online editor. Subscribe to the print or digital version here.